Hey hey, it’s Christmas week! I can’t believe it’s already here. This month (this year) has flown by and I want it all to slow down. Isn’t that something parents say? Maybe this blog is my baby (weird realization). I usually try to hold onto Christmas day like it will never end, and then treat the 26th like the saddest day ever. Part of my childish self still does that, but I’m getting better at savoring it for what it is and then letting it go. Besides, next week we have New Year’s to look forward to and a whole new year to live out! Look out 2015 – we’re comin’. Onto the food, because you need to eat this week. You need to eat really, really well. This list isn’t as extensive as our 63 Simple Thanksgiving Recipe roundup, so refer back to that for even more recipe inspiration. But I’ve grabbed everything holiday-related for your enjoyment. With that, let’s dig in! And know that we’re super thankful for you all and your support, and we hope your week is filled with lots of delicious eats and time with friends and family. Cheers! Happy holiday week friends! See you back soon for another recipe. I’m making a completely Minimalist Baker Christmas Eve dinner tonight for my family! Thank you so much for the recipes! Yay! Hope you love it, Hallie! This whole post is magical. MERRY CHRISTMAS! YOU’RE MAGICAL. Merry merry friend! I plan to wake up with some S’mores Hot Chocolate Christmas morning! Yumm! I received the recipe for the bean salad. How do I get the recipe for what you just put on for the holidays. I haven’t done the bean casserole yet but will soon. Have already shared it with friends. your recipes sound delicious and glad your showing pictures of each one. This is an awesome round up, but I can’t stop thinking about those green beans!!!!! YUM! Mmmm great roundup! A great reminder of how lovely this blog is! Ah, thanks for the kind words! 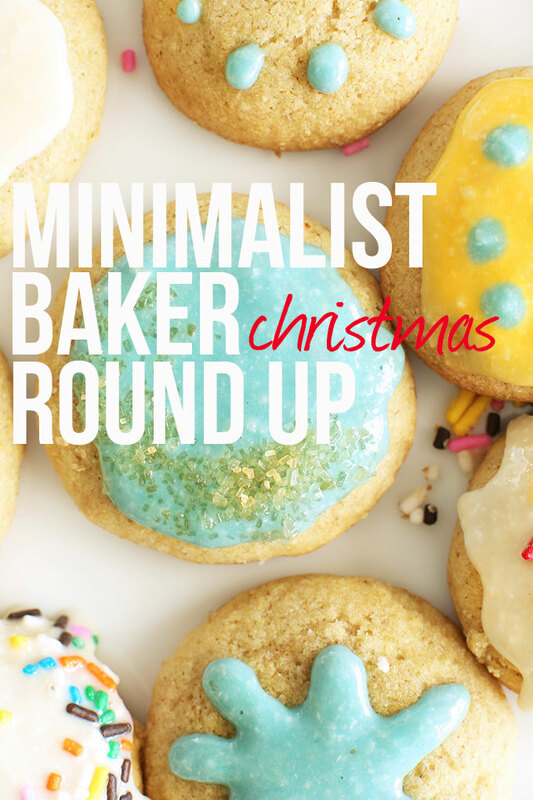 If you don’t stop pumping out awesome content all the time, my Pinterest is going to be ALL Minimalist Baker! Ha, great stuff as usual! Merry Christmas to both of you guys. Haha, sorry for the Pinterest problem. And so cool you asked for the photography school. Hope you get it! I still need to make that drinking chocolate. Looks so thick and PERFECT. Happy holidays to my favorites! TIS! It’s my fave. DO IT. STAT. Love the round up!! I can’t believe Christmas is already here! Me either! Hope your Christmas is grand, Gaby! So many delicious recipes! I love the pot pies! 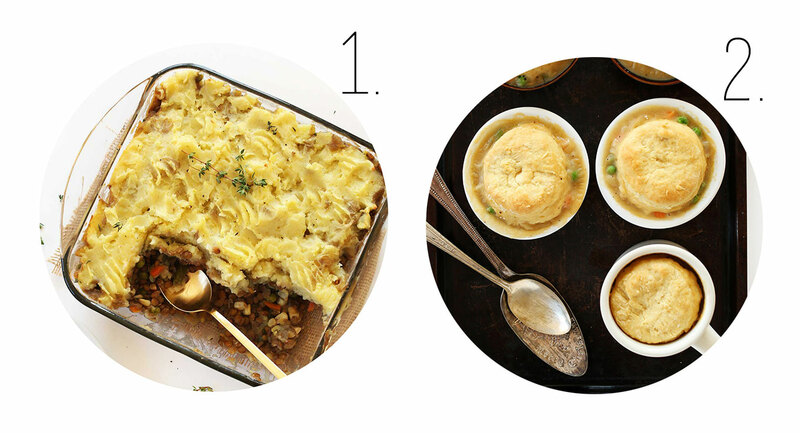 What a great round up of recipes! The peppermint drinking chocolate looks DIVINE! Looks like a very merry and delicious vegan roundup! Merry early Christmas to you, friend! Merry Christmas to YOU friend! Hugs from the West Coast. What would I do without your roundups? Just another way you make my life 100x easier ;) Merry Christmas, Dana and John! haha, I don’t know! Hope you are able to make a few of these this week. Happy Christmas to you, Kathryn! Thank you so much for all the recipes! Your email is something I look forward to reading every time I see it! I can’t even imagine all the time, energy, and kmowlege you share with us. You help to make my life so much simpler. All your recipes are so good! My favorite right now is the Gingerbread cake! Thanks again and Mery Christmas! So grateful you posted this. Needing to plan some healthy meals after the festive excesses.